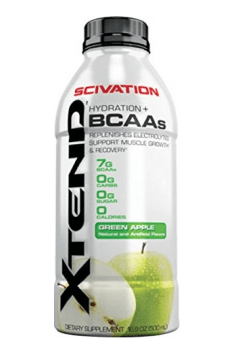 Scivation Xtend RTD is a blend of substances in the form of a convenient and tasty drink that supports exercise capacity, regeneration, and hydration. The supplement is intended for all physically active people regardless of the stage of their progress or their favourite disciplines. Branched-chain amino acids (BCAAs) are one of the most popular types of supplements used by people who take care of the condition of their muscle tissue, which is a vast majority of athletes. They stimulate anabolic processes mainly thanks to leucine (whose forms of isoleucine and valine are used in the preparation in the proportion of 2:1). Supplying the amino acids helps to reach the so-called leucine threshold, that is the minimum portion of leucine that can induce anabolic processes in the organism. Isoleucine contained in the BCAA blend affects insulin sensitivity in cells. The increased sensitivity of membrane receptors to insulin has a beneficial effect both on health and on exercise capacity. It helps to reduce blood glucose levels, that is one of the main factors that induce cardiovascular system diseases. Apart from that, improving sugar transport to muscle cells makes it possible to extend a training session and delay the feeling of tiredness. Moreover, tests demonstrate that BCAA supplementation inhibits the expression of the MAFbx protein, that is the muscle atrophy protein. It is responsible for catabolic processes. Inhibiting the activity of the protein reduces the risk of losing muscle mass, giving branched-chain amino acids a protective function regarding muscle tissue. There are also reports suggesting that BCAAs help to delay the feeling of fatigue. The effects are particularly promising in the case of athletes who do endurance disciplines. Supplementation with branched-chain amino acids allows to extend the duration of an activity while maintaining a constant level of physical capacity; it is also able to reduce the mental feeling of tiredness. The preparation also contains taurine, a commonly known component of energy drinks. It affects metabolism in glial cells, that way regulating the activity of neurons, which results in an increase in cognitive abilities. Taurine used in the supplement makes it possible to maintain full focus even during the toughest training as well as to stimulate psychomotor coordination. Moreover, taurine is a creatine transporter, thanks to which it stimulates the use of the substance for energy purposes. In that way, it regulates the mechanisms of muscle tissue nutrition and consequently, helps to achieve better results. Tests also demonstrate that taurine supplementation is beneficial for the regeneration of muscle tissue by reducing the time of the development of myocytes after workout. The supplement also contains complementary citrulline malate. The substance stimulates the activity of the enzyme eNOS in the organism, which regulates the endogenous synthesis of nitric oxide. By increasing the concentration of NO in the body, citrulline helps to dilate blood vessels, which increases blood flow. In terms of exercise, it is connected with better nutrition of muscle tissue, which enables its more intensive work. Increasing the transport of nutrients to muscles also translates into enhanced post-workout regeneration. The mechanism described is experienced as the so-called “muscle pump”. During intensive physical activity, we produce sweat and lose valuable mineral substances with it called electrolytes. They are responsible for regulating the stability of water management in the organism. Sacrificing them for the regulation of body temperature is connected with the decrease in the number of electrolyte ions in other physiological processes. A reduced supply of mineral compounds causes problems in the functioning of cells, which are visible mainly in dysfunctions of the nervous and muscular systems and as a result, reduced exercise capacity. Supplementing electrolytes during workout prevents such situations. To sum up, Scivation Xtend RTD is a versatile addition to training that stimulates physical capacity in many ways. Not only does it supplement electrolytes and regulate the hydration of the organism, but it also helps to increase physical capacity, stimulates anabolic processes, and accelerates post-workout regeneration. The supplement constitutes an excellent alternative for water during workout. It performs the hydrating function much better than ordinary mineral water, and it additionally contains a number of substances that help to increase exercise capacity. An additional advantage of the supplement is its pleasant fruity taste, which has nothing to do with sugar – the supplement does not contain any carbohydrates. Purified Water, Citric Acid, Natural and Artificial Flavor, Sucralose, Acesulfame Potassium, Malic Acid, FD&C #Red 40. Contains no fruit juice.